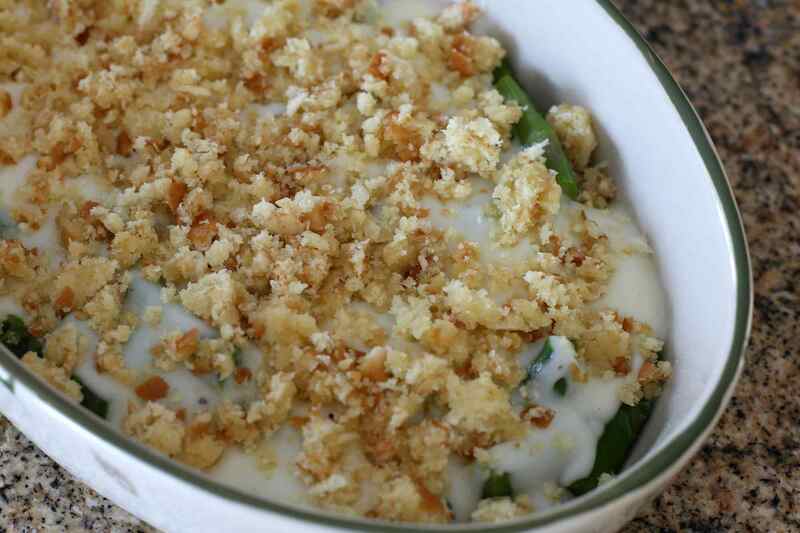 This old-fashioned asparagus casserole is layered with cracker crumbs , shredded cheese, and sliced hard-cooked eggs. It's an excellent casserole for a brunch or holiday dinner. This carrot casserole is a wonderful change of pace from the everyday glazed carrots. Sliced carrots are cooked and then combined with a basic cheddar cheese sauce. The gratin is baked with a buttered bread crumb topping. This summer squash casserole is made with stuffing mix, sour cream, and some shredded carrot for extra color. This sweet potato casserole is a big favorite! We have received dozens of positive comments about this casserole. You can't go wrong. This Brussels sprouts gratin comes together with a rich fontina cheese sauce with a touch of nutmeg. Add some crumbled bacon or leave it out. The casserole is finished with a buttery bread crumb topping. This corn casserole is made with a rich white sauce and finely chopped bell pepper. The crunchy bread crumb topping adds just the right amount of texture. I double the topping. This popular creamy corn pudding is very tasty, and it's the perfect accompaniment for a pork roast or baked ham. It's an easy preparation with corn kernels and cream-style corn along with milk and eggs. Add a little sugar if you like a sweet corn pudding. You might only use celery as a seasoning vegetable or as a crunchy addition to salads. This celery casserole proves it can stand on its own. The celery is cooked and then combined with water chestnuts and a condensed soup sauce. The buttery toasted almond and bread crumb mixture is the perfect topping. This mashed potato casserole is loaded with the flavors of bacon, cheese, sour cream, and seasonings. This indulgent casserole is perfect for a special dinner or potluck. This butternut squash casserole includes apples and is topped with a buttery spiced crumb topping with brown sugar. This is a tasty side dish for any fall meal, and it would be a perfect holiday dinner casserole. This creamy cheese sauce for these scalloped potatoes is made with a sharp cheddar cheese along with a basic white sauce, or bechamel. The cheddar cheese sauce is seasoned with some spicy mustard and garlic. The cheddar cabbage gratin casserole is topped with a crunchy butter and bread crumb topping with some optional Parmesan cheese. This macaroni and cheese is made with cheddar cheese and some cream, making the sauce extra creamy. Use buttery croissant crumbs or bread crumbs to top the macaroni and cheese. This potato casserole is always a hit. Take it to a potluck event or serve it for dinner or a big breakfast or brunch. This sweet potato gratin is savory, a refreshing departure from the ubiquitous sugary or marshmallow-topped sweet potato casserole. It's a simple combination of only five ingredients, including cream and Parmesan cheese. Crumbled bacon and onions lend fabulous flavor to the sauce for these scalloped potatoes. These baked leeks melt in your mouth with the creamy, garlic-infused sauce and rich fontina and Parmesan cheese topping. The combination of new potatoes with fresh or frozen green beans makes a delicious side dish. Even if it isn't the season for new potatoes, the dish is wonderful with baby potatoes or fingerling potatoes. This vegetable casserole is filled with flavor and color. The basic white sauce brings the vegetables together, and the crunchy buttered bread crumb topping is the perfect finishing touch.